Here what one of the FL Governor Candidates just concluded: Syria and Putin is a large fraud. There is no Al quada and there never was.Its justr a play,played by statists. Its a false play to make us (inclusive or exclusive Assad)believe ,there is a civil war and bad guys are on the opponent's side. Remember the Iranian (republican guard officers) "Pilgrems" who got caught near Damascus. 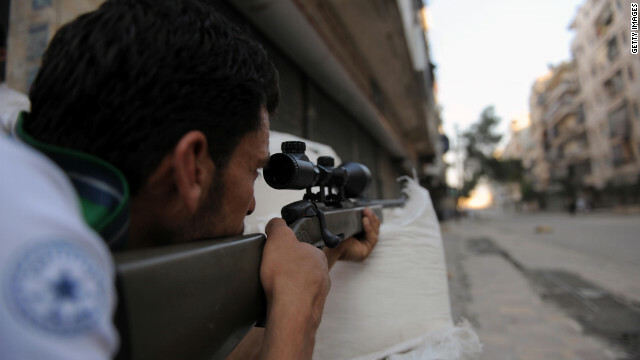 There were thousands more infiltrated , to "play" Al Nusra and Al Quada forces,not one shot was ever aimed at them ! They just pretended they would be aside Gen Idriss ,the FSA, but all they did ,reveiling targets ,false play to them. And bluffing to be against Assad . When the time is right open friendly deadly fire . A horrifying Situation for the FSA . Once Hezbollah found out ,hoe this fooling and killing works,they joined in,Assad never asked them to do so.He will regret soon ,when the Hoax blows .The Hoax will blow this eve , in Geneva , when Russia has to answer certain questions.Saringas availability is endless, so what a cheap offer from Putin " we surrender the depots ,if you take down the threat(use of force) . Kerry can break away from these dishonest gang anytime at the latest Sunday. on the spots offered to give them up,at best 12% or so. A joke,we should refuse to even talk about such offers ,since they can always lie , hide,replainish,refill,relocate etc etc. ASSAD KILLING MUSLIMS @ THE BEQUEST OF TERRORISTS AKA IRAN. THREE OR FOUR GENERATIONS OF MUSLIUMS GASSED TO DEATH BY ASSAD AT THE BEQUEST OF THE PUTIN BULLY. I believe is more effective to send them an army of "Jehovah Witnesses", "Mormons" and "Hare Krishna" so Muslims can be domesticated. lots of acts of terror in syria today and other places in the region against christians & those related structures–this means there will be many acts of terror on the backside of 911, 2013.-compared to 2012 ect. Sounds like the UN is imminently qualified to perform the hunt and destruction of Syria's chemical weapons. The US doesn't have a dog in this fight and should bow out gracefully. Our Congress just got the reprieve they need! Our "do nothing" Congress can now relax! "We, the people of the USA" want nothing to do with Syria's problems. Our Congress doesn't listen to us, they only listen to money! Syria is Russia's "problem child", not ours. Just like North Korea is China's problem. When we finally told China to get their "problem child" controlled or suffer severe economic consequences, what happened? North Korea suddenly changed their belligerent stance! Same with Syria. Syria is Russia's problem, not ours! Keep in mind that Russia is no "democracy" just another country ruled by a powerful dictator! Nothing happens without Putin's consent! Our European "allies" are now so dependent on Putin's gas that they dare not support any US actions we propose in Syria! Anyone wanting to support the US in Syria will certainly get their gas shut off by Putin! Italy just became the next victim of Putin by recently signing an agreement to a "take or pay" gas deal with Russia! What idiots! Another European country lost to Russia! Putin doesn't need tanks nor nuclear bombs anymore, he has the gas that Europe needs! This is his new favorite weapon. "We choose to do this not because it is easy but because it is hard"
Thought you guys could use some inspiration. All we need to do is put our war machine behind getting it done asap. Surprise them by how efficient we are at destroying it. Right it wont be easy but its possible. And worth working hard for , many times more than killing people. Otherwise I totally support sending troops, starting with every single member of the house, and senate .